You own the intellectual property rights in a successful consumer entertainment or product. Some features in your “work” are suited to exploitation in a different consumer market. clothes or food from a sporting event. However, this licence agreement could be used for any situation where intellectual property rights are licensed for some sort of exploitation by another business. The agreement may last for years, or for the duration of the event. Merchandise may be sold at the event, after the event, in shops, via the Internet or in some other way. This agreement gives you all such options. It is drawn to cover many alternatives and to protect you, the owner of the rights. You will receive an up front fee and/or a royalty on sales. 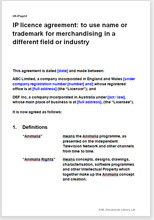 Rather than using legalistic words, we have assumed that for this agreement the merchandise is related to a set of children’s TV characters called “Animalia”. As we explain in the drafting notes, you will want to change that definition to “Barnsley soccer Derby”, “International Darts Festival”, “Dark Green Jade Concert”, or as your case may be. We have provided for both an up front payment and a royalty based on sales. You can choose one or both. A licensor will often want a fixed sum up front, just in case the merchandiser is not as good as he says he is. The software, drawings, specifications and know-how of Animalia will be supported by additional licensed material. That might be trade marks, registered designs, know-how and other intellectual property which is essential to its operation but which is not itself part of the Animalia rights. You license this extra material only in support of the main product. It is subject to stricter protection. You choose the exact deal you want in this agreement. You are always in control. You can choose the period the deal is to run, the type of merchandising, countries for selling, quality of goods and more. Each of these is the subject of a separate sub paragraph, for easy edit by you. You can choose “in” or “out” or edit. If you have an idea or product you want to pass to someone else to make and sell, we offer more suitable Assignment, sale and transfer in our library. All Net Lawman documents are written to protect primarily the document buyer. However, we do not invite problems for you by ignoring the likely requirements of your counter-party. There are many provisions in this document which satisfy the concerns of a fair minded licensee. The drafting notes you receive with the document elaborate on this point. This agreement provides the complete legal framework for what would otherwise be a complicated deal. The Net Lawman modular structure in plain English takes you smoothly through the detail of a document of over 6,000 words. "While I am not a large user of legal documents I will nevertheless resume to recommend Net Lawman to all others that have use for this expanding service." "Very easy to navigate for those who are not very computer illiterate. Information sought was provided very expeditiously."